A fascinating new image has appeared on the Internet that is really causing some people to question the validity of their depth and image perception. The image was uploaded to Facebook by a user named Savannah Root. Once in place on the popular social media network site, it quickly went viral, taking on a life of its own and reaching millions of viewers in a very short period of time. But what exactly does the image contain? That's the great mystery that is currently occupying viewers and causing controversy all across the world. 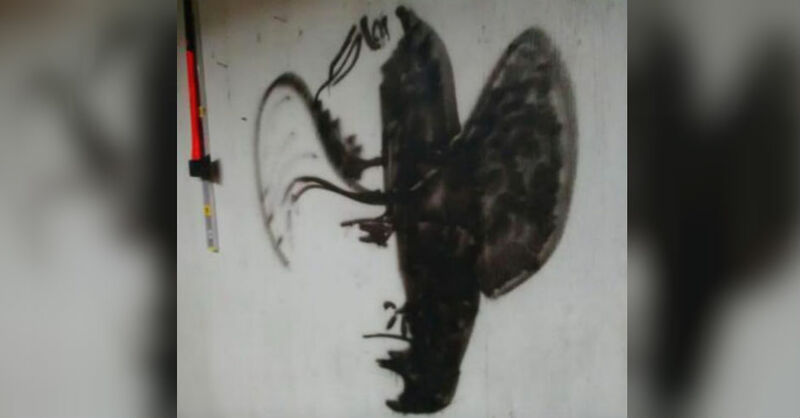 The fact of the matter is that, when confronted by this bizarre image, most people will tend to believe they are looking at a bat or some other insect like creature hanging upside down from a cave wall. Others seem to think that they are perhaps looking at a grainy black and white image of something like a fire extinguisher or other oblong shaped object. Only a very people are able to look at the image and size up its true features in a short period of time. Most viewers need several moments, or even several minutes, before they are finally able to grasp what is really going on. When it comes to quickly being able to decipher the true nature of the present image, you'll need to be fast on your feet and quick with your eyes. It's all about light, shade, and depth perception. If you focus your eyes on the image for long enough, the image will resolve itself into its true form. But the reason your eyes are fooled at first (assuming you were one of the vast majority of viewers who couldn't figure it out in a few seconds) is because the image is shaded very darkly at the right, and most eyes tend to wander to this darker half. But, on closer inspection, you will soon discover that what is there in the dark is always there in the light as well. Specifically, you just need to train your eyes to wander over to the left side of the picture, which is the lightly shaded half. After a few moments of strong focus, you should be able to figure out what's really there. And when you do, you ought to be very pleasantly surprised. Of course, if you figured it out right away, you deserve congratulations on your superior perception skills. On average, only three out of every 100 people gets it right within a few seconds. When all is said and done, the image is a really clever way to highlight the way in which our eyes can so easily be fooled by a bit of strategic misdirection using the premises of light and shade. So what really is there in the image? If you haven't been able to figure it out by now, you'll be pleased to know that it's really just a man in a cowboy hat. Since his face is half hidden in dark shadows, lots of people will go to their graves insisting that they only saw a bug or a bat hanging upside down. But readers of this website know the truth and will never forget the lesson learned. The take away should be to never rush to snap judgments when just a little more close observation just might reveal a whole other order of truth.